Heck even I can do it! This morning, with a handy lighter and the box itself as a ‘placemat’, I sat at my dining table and gave it a go before throwing away the leftover sprues of my VF-1A build. I started to get the hang of it after a few tries. The key is how soon you can start pulling (the plastic has darkened and started to sag) and for how long before it snaps after cooling down. 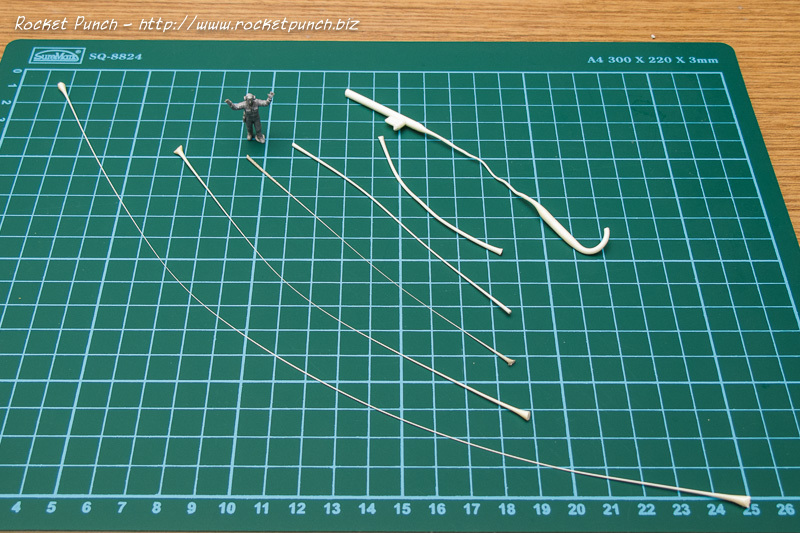 So eventually I managed to pull the sprue longer and longer although it started to bend when it got too long. I can even use the ‘mistakes’ (right most) for detailing my figure bases I think. Now why did I even try to do this? Well, I have a build right now that might need some sprues to replace raised panel lines. Let’s see how it turns out. First a disclaimer: this DVD does not teach you how to assemble a kit. It does teach you how some simple techniques can really ‘pop’ a kit and bring it to another level. Traditionally, weathering and finishing of model kits are done with oil, enamel or lacquer products. The general understanding is acrylic-based items are not suitable for the job since acrylic paints tend to be have bad coverage and chips easily. Miguel Jimenez was the man behind Mig Productions, one of the more popular products for weathering and finishing model kits. He has since parted company with Mig Productions. This DVD is a joint release with Acrylicos Vallejo, the manufacturer of the Vallejo line of acrylic-based finishing products, to show that good finishing and weathering can be achieved, even with acrylics. I have been using acrylic-based products more or less exclusively for about 6 years now. I like how there’s very little smell (especially Vallejo products) and it’s toxicity level is much lower than enamel and lacquer paints. However, I still have to use some enamel, lacquer or oil-based products when it comes to weathering. This DVD is of particular interest to me since given a choice, I’d switch 100% over to acrylic finishing. I mailordered the DVD from Panther Models Ltd in merry ol’ England. One Paypal payment and 10 days later, the package arrived. A pleasant surprise was the inclusion of a 5% discount coupon I can use towards Vallejo products. Nice. Included with the DVD is a 7 page full-color booklet summarizing the contents of the DVD. Sort of like a crib sheet. 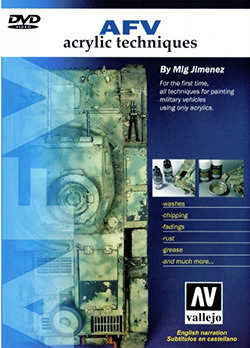 The DVD itself has Mig himself building a Panzerkampfwagen II kit from the start of painting to completing the kit with weathering and detailing. A nice touch is how the whole video is split into convenient chapters so you can always go back and re-watch one particular aspect of the finishing process. The narration (by Mig?) is clear and concise although a bit fast. But if you’re used to the English language, it shouldn’t pose a problem. There is a hint of accent in the voice but it’s nothing jarring. Best of all, the whole video is done with the kit covering the entire screen so you can see the processes clearly. I gather you can even ‘get’ what’s going on even if you turn off the sound. The chapters are divided logically and I like how nothing is glossed over. For example the chipping section, Mig actually shows you how he does chipping on more than one part of the kit so you get a more concise idea of how and why it’s done the way it is. He does do some things differently like adding gloss varnish in his paints so he doesn’t have to gloss coat the kit before the decaling stage. He also doesn’t preshade or use red brown as base color but it still works. I find it interesting how he even controls the tones during the primer stage: he highlights parts that get more exposed to light with white primer. Best of all, he gives reasons to why he does everything, which you can then adapt to your own skillsets. Of course this being a Vallejo sponsored DVD, everything you see in there is from Vallejo. This includes the primer, paint, gloss/matt varnish, decal softener/fixer, pigments, wash and even the paintbrushes. If you thought Vallejo only had paints, think again. Everything that Mig uses in the video has a different branded alternate. The alternative might not be acrylic-based, but there’s nothing wrong with that. That’s the beauty of it I think: You might not use acrylic products, but all these effects and finishes can still be learned through this DVD. The topic of this DVD is armor, which lend themselves to a ton of weathering and detailing. However, it won’t be hard to adapt the skills shown here to other genres like aircraft and sci-fi. If you’ve ever wondered how modelers achieved their finishes and detailing, or if you’re thinking what can be done after switching to all acrylic products, or if you just want to see what can be done to bring your kit into the next level, this DVD is for you. I hope Mig comes up with more DVDs of this quality. Highly recommended!